In yesterday’s Set Points, I wrote that it had been a pretty quiet start to the week in Rome… of course, that all changed on Wednesday! All the remaining top eight seeds were out in force and of the six that played, just one survived! The upset train was chuffing into action once more as this wacky year of WTA continues. Read on for Wednesday’s Set Points in Rome. Note that a sweep of third round previews will be posted later tonight (if i’m still awake). A very gutted and disappointed Azarenka. Thought back was ready to go but obv not as pain came back. While Azarenka’s clay court preparations for the French Open grinded to a halt, Garbiñe Muguruza was in emphatic form, dropping just 19 points in a 47-minute, 6-1 6-0 demolition job of Ekaterina Makarova. She was the only top eight seed to win on Wednesday! The other three matches which were all first up on Wednesday’s schedule produced one-sided results. 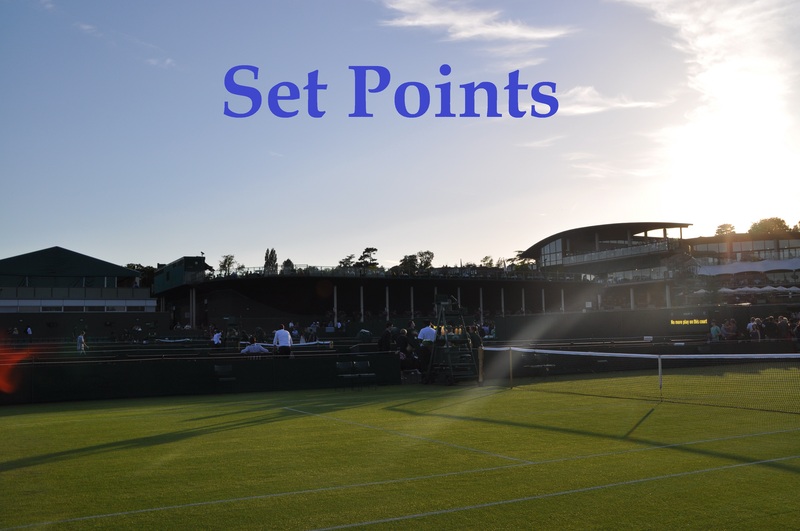 Jelena Ostapenko didn’t drop a point behind her first serve in a 6-1 6-1 rout of Monica Puig, Daria Kasatkina dropped just four games against Mariana Duque Mariño and Barbora Strycova recovered from a 0-4 first set deficit to win 12 of the last 14 games against Heather Watson. Eugenie Bouchard was next aboard the upset train, taking out the number two seed, Angelique Kerber, 6-1 5-7 7-5. It was Bouchard’s third consecutive victory against Kerber, who has endured back-to-back losses in Madrid and Rome. The quality through the first two sets was pretty shocking and Kerber was very disappointing early on; she produced some untimely double faults and a constant stream of errors, mostly backhands, into the net. She didn’t look comfortable with the conditions and couldn’t settle as Bouchard kept things steady. Kerber: "I'm playing so badly, can't get anything going. It's not working. Not been working for days"
Kerber began to get some more balls in court in the second set as Bouchard began to do the opposite! Bouchard led 6-1 *3-0, but Kerber recovered both breaks back and then saved two break points at 5-5 *15-40. Kerber broke for the set on one of the best rallies of the match, nailing a tricky overhead. The third set was actually pretty decent after the ropey ride of the first two sets. Bouchard was rewarded for her boldness with Kerber playing quite passively; this may have been because she just never looked comfortable in her groundstrokes and movement. A backhand winner and a second ace of the match helped Bouchard dig out of a hole at *4-5 *30-30 hole. The Canadian player then broke serve thanks to a backhand pushed long from Kerber. The final game went to deuce but Bouchard held on for a huge win. And here’s a very insightful piece with Genie where she talks candidly about her struggles in 2015. The next of the top eight seeds to fall was Roberta Vinci who was dropped a first set bagel by Johanna Konta in just 22 minutes! Vinci got on the board in the second set but Konta was too strong, saving five break points in a crucial six-deuce game at *4-3. For Vinci, she has never managed back-to-back wins in Rome (through both main draw and qualifying) in 18 previous visits to this tournament. Konta moves on and with some stunning stats. Last week’s Madrid champion, Simona Halep also lost in her first match of the week to Daria Gavrilova. The Aussie produced some really smart and gutsy tennis, mixing it up in the third set and defending brilliantly against a subdued Halep. The match ended with two terrible service games as Gavrilova was unable to serve it out, but she broke to love in what would be the final game for the victory, 6-3 4-6 6-3. Two more seeds to fall on Wednesday were the number 10 and 13 seeds, Lucie Safarova and Ana Ivanovic. Lucie couldn’t get her game going today as she was defeated by an excellent, Misaki Doi. While i’m obviously sad for Lucie, i’m pleased to see Misaki doing well. Lucie saved three match points in style, but Doi sealed the win, 6-3 7-5, when a Lucie return went long. Ivanovic had won all four previous encounters against Christina McHale, but the rapidly improving American fought back from a set down to record another superb win in 2016, 6-7(3) 6-4 6-1. With a return long, Doi wins, 6-3 7-5. Well played from Misaki, more persistent aggression. Lucie couldn't get her game going today. I loved this little interview with Lucie in preparation for the Aegon Classic in Birmingham. On a positive note for the seeds, Timea Bacsinszky and Svetlana Kuznetsova are both looking great during this clay court season. Bacsinszky has nine wins on the clay this year and has dropped just ten games in her victories over Yanina Wickmayer and Lesia Tsurenko in Rome. Kuznetsova is also yet to drop a set with super impressive victories over Caroline Garcia and Sam Stosur. The last two matches of the day saw two more seeds fall! Madison Keys produced a supremely clean display to take out the number five seed, Petra Kvitova, 6-3 6-4. Keys hit nine more winners and six less unforced errors to complete the win in one hour and 18 minutes. That’s how you close: Madison Keys fires three straight aces to beat Petra Kvitova 63 64. Plays Venus or Babos, who are still grinding away. And finally, last but not least, Timea Babos defeated Venus Williams, 6-7(5) 7-5 6-4 in two hours and 55 minutes. This was an utterly exhausting match to watch (and probably for the players to play haha) but it was AWESOME! In my current clouded memory, this is my favourite match from the past two weeks. Babos was up *4-1 in the first set, but Venus battled back, in classic Venus style. After what had been a high quality first set, a messy tiebreak ensued. Babos facepalmed after a failed drop shot and then promptly lost the set on yet another error. The third set was just brutal with some cracking rallies, bad misses and seven breaks of serve. Babos fought back from *1-3 *40-Adv down. The fight from both players was magnificent. The way that Venus battles her way through these kind of matches is really inspirational. She does though seem to come up second best in a lot of them! Babos wasted a lot of leads in this match with some mentally wayward shotmaking but she really dug in deep at the end. The match of course ended with some drama. With Venus serving at *4-5 *40-40 and after having missed with a first serve, a ballkid behind her fell over backwards in quite spectacular fashion with all the balls going flying. This created a pause with Venus then serving a double fault… tough on all parties (except Babos!). The Hungarian player converted on her first match point and was understandably jubilant. This could be a huge win for Babos but will be a tough one to recover for tomorrow. A wonderfully absorbing match that fluctuated in quality but will definitely go into my spreadsheet of 2016’s best matches. For some great pictures from Rome, check out Monique Filippella on Twitter. And finally, this is wonderful to see! May 11, 2016 in Rome, Set Points, WTA. Tough loss for Ana but from what I saw Mchale was on fire with that forehand and her serve. Serena could legitimately be in trouble if she can keep this level going. I’m disappointed we won’t see a Halep v Kuznetsova match but pleased for Gavrilova after such a rough year. And Kasatkina has a chance here as Begu has to try and back up her career best win. But she needs to stay on the front foot. She has a forehand she can dictate with but she has to be aggressive. Mchale played well. But Ana is also a beatable target these days. You should play her like you can. It’s a head case for Ana. Ostapenko seems to be getting hot this tournament I hope Garbine is up for this one. I’m kind of worried that Caroline Garcia might take Mladenovic away from Timea Babos for good. Such excellent success in a short partnership. But the focus on singles has done Timea some good. She may beone of the most improved on tour this year. And when did she develop such a strong ace serve!? I think Timea always had a hot serve she just obviously lacked a bit of confidence on it. Speaking of her playing doubles… does anybody know why her and Sloane Stephens never paired up on the main circuit when they had so much success as juniors? Was it a falling out? No idea about Babos and Stephens. Focusing more on singles seems to have really helped Babos. I still feel like hiding behind a pillow anytime she’s in a lead or serving for a set/match, but loved the way she fought in the third set against Venus yesterday. It was such an entertaining match. Fair point about Ivanovic. To be honest, I don’t feel like the partnership with Nigel Sears has ever really flourished. I agree. But I also think Ana needs to take more responsibility for her shortfalls. She actually has most the elements for being a top player but she really doesn’t employ them convincingly. Yeah it’s all there with the game, she looks so tense and fraught in matches right now and can rarely string good matches together. The performance vs. Halep in Dubai was terrific but then she failed to back it up vs. Strycova in the next round. yes Mona back form illness…finally!